Era Jewelry Design was founded in 2015 by a French Canadian jewelry artist Audrey Longtin. Audrey – now a resident of Wrightsville Beach – scuba dives into the Atlantic Ocean to recover shark teeth and fossils that she then transforms into unique pieces of jewelry. Audrey’s creations are available for purchase online or at The Workshop, a brand new concept that integrates her passion for jewelry, scuba diving and good coffee. The Workshop even brings a touch of French flavor to Wrightsville Beach from the almond croissants served in the morning to toasted baguette sandwiches for lunch. Noni Bacca is a boutique winery offering over 70 varieties of wine, all of which are produced on premise. Owners Toni and Ken Incorvaia have been producing world-class wines since 2007, racking up 111 international medals along the way. They have a long history and deep knowledge when it comes to wine making that was handed down to them from generations of European wine making traditions, the result of which is old world wines paired with new modern styles. The tasting room is open seven days a week and offers wine tasting and wine by the glass or bottle. Island Roast Coffee, located in nearby Carolina Beach, is a locally owned and operated coffee roaster specializing in high quality Arabica coffee. It was established by a retired Army Special Forces soldier that developed a love of coffee after spending time in some of the world’s premier coffee growing regions. Island Roast Coffee offers approximately 30 different varietals, blends, flavored coffees and espresso blends from Africa, South and Central America, and Indonesia. The company roasts its coffee daily in small batches to ensure the peak of flavor. Coffee is available as either whole beans or universal grind and can be purchased in-store or online. The Freaker is a one-size-fits-all beverage insulator. Freakers are known for keeping drinks cold, hands dry, and fitting a wide variety of drinking vessels – water bottles, wine glasses, sippy cups and more. Freaker USA was established in Wilmington in 2011 with the help of a Kickstarter campaign and is still headquartered here to this day. Designs range from animals and colleges to places and even DC Comics™. Freakers can be purchased at several Wilmington-area retailers, including Edge of Urge. Out of Eden Soaps was born in 1998 out of a passion for horticulture. Founder Carol Crow, an avid gardener with a degree in Horticulture, was looking for a way to use the herbs she often had leftover at the end of the season. She tried her hand at soap making, and a business was born. Today, customer favorites include vegan-friendly herbal and natural soaps, glycerin soaps, lotions, lotion bars, bath salts, bubble bath, candles and laundry soap. 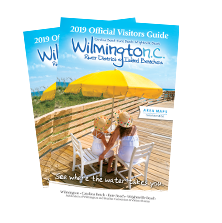 Out of Eden’s products are available for purchase online or at Wilmington’s Blue Moon Gift Shop, which features products from over 100 artisans, retailers and entrepreneurs and has been voted as the best gift shop in Wilmington multiple times. 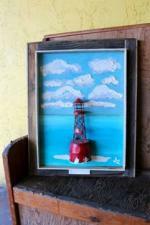 Wrightsville Beach Art Company features 3D nautical-inspired art made from recycled items by Jazz Undy. Jazz’s lifelong attraction to the water has strongly influenced his work as an artist. He now works primarily with oils and acrylic paints and often incorporates discarded materials and found objects into his pieces. As he likes to say, he is “saving the planet one painting at a time.” Wrightsville Beach Art Company is the island’s only art gallery. Candles Etc. is the home of The Old Wilmington Candle Company. Located on Market Street in Wilmington, Candles Etc. offers candles made of 100% natural, sustainable soy wax that are handcrafted by artisans. Candles are clean, slow burning and soot-free, and come in a variety of scents. Candles Etc. also has a wide variety of candle accessories and creative gift items, along with works by local artists like photography, art glass and rock candles. Wilmington is home to several other co-ops that showcase work by multiple local artists and crafters. Port City Pottery & Fine Crafts is dedicated exclusively to local handmade, one-of-a-kind, three- dimensional art. The ArtWorks is an art village dedicated to fostering a creative environment for artists, educational opportunities, and enhancing the community through art. Saltwater Surf Art Gallery in Carolina Beach features art, jewelry, clothing and other hand-made items all made by local artists. Going Local Artisan Gifts features over 75 diverse artisans from the mountains to the coast of North Carolina.